Do you know someone who feels unloved? This gospel cover is perfect for those who need to know that He first loved us while we were sinners... while we were His enemies. Use this gospel to reach the broken-hearted who so desperately need His grace and redeeming love. 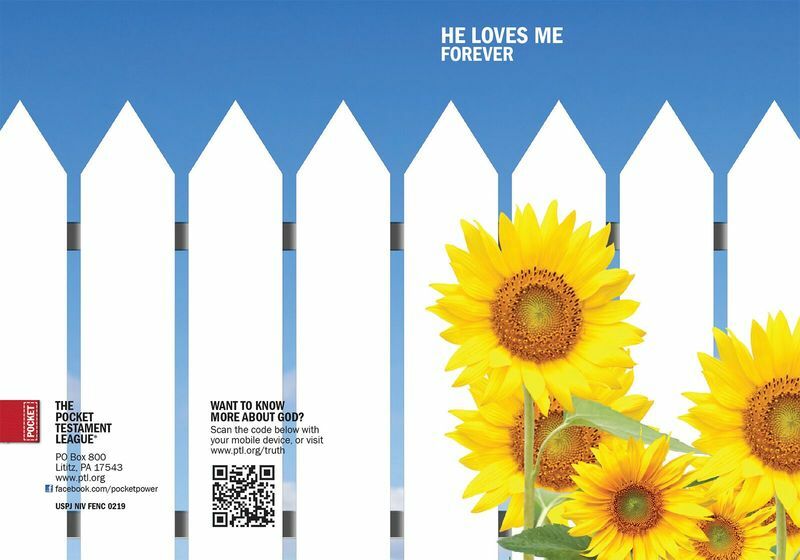 This cover features a nostalgic picket fence with happy sunflowers growing at its edge. Although life doesn't always look like this ideal scene, its message of God's enduring love speaks louder than life's circumstances and difficulties providing hope and peace. Like all our gospels, it includes the Bridge illustration, suggested salvation prayer and decision page. It also features a QR code on the back cover that makes it easy to learn more about God by simply scanning the image with a mobile device. We re-print products regularly; please check back later. The Pocket Testament League depends on financial gifts of members to help meet the costs of printing and shipping Gospels, and producing other ministry resources. We have a number of exciting ways that you can invest in bringing the Word of God to the lost. Find out how you can support the League.